Thinly Traded Stocks - What Does It Mean? What are "thinly traded stocks"? 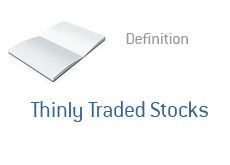 What is the definition of a "thinly traded stock"? If a stock is "illiquid", that means that it is thinly traded. Liquidity refers to the number of buyers and sellers of a stock. If there are many buyers and sellers present (say, in the case of Microsoft), then the stock would be considered "liquid". If there are hardly any buyers or sellers present, then the stock is considered to be "illiquid" or "thinly traded". What's the easiest way to spot a "thinly traded" stock? Volume. If a stock trades millions upon millions of shares per day, then it would definitely not be considered "illiquid". Why? There are obviously many buyers and sellers present. However, if a stock trades just 4,500 shares per day on average, then it can be considered as illiquid and thinly traded. The dangers of trading in thinly traded stocks are apparent. If you want to buy a position, then you may end up paying more than you had hoped, due to the lack of volume and sellers. Also, if you are eager to offload your position in a thinly traded stock, you may have problems getting the price that you desired. If you are looking to sell your position in a hurry, then you may be in for a rude awakening in terms of the price holding up, especially if there are other like-minded investors looking to sell as well. Some people prefer to invest in speculative, thinly traded stocks. Me? I prefer stocks with volume.